The Trinity, or the triune nature of God, is a difficult concept to grasp even for Christians. It is no wonder that Jehovah’s Witnesses and Muslims accuse Trinitarian Christians of polytheism. While we believe in one God manifested in three persons, in our conversations we treat the three persons as three separate entities, but they (He) are (is) not. God created man “in our image, after our likeness” (Genesis 1:26, emphasis added). Man has a triune nature composed of mind, spirit/soul, body, as does God, but we do not think of ourselves as three separate entities. This thought occurred in my mind, my spirit motivated me to write it down, and my fingers, i.e., my body, carried out the will of my mind, yet I am the one writing this. To the woman at the well, Jesus said, “God is a Spirit: and they that worship him must worship him in spirit and in truth” (John 4:24, emphasis added). A spirit is invisible. Likewise, you might be able to dissect my body and inspect my brains, but you can’t see my mind. John says, “No man hath seen God at any time; the only begotten Son, which is in the bosom of the Father, he hath declared him” (John 1:18). “Declared” translates the Greek word exegeomai from which we get our word “exegete,” and it means to explain, make known, or reveal. In His last hours before His crucifixion, one of His disciples, Philip, asked Jesus, “Lord, shew us the Father, and it sufficeth us. Jesus saith unto him, Have I been so long time with you, and yet hast thou not known me, Philip? he that hath seen me hath seen the Father; and how sayest thou then, Shew us the Father?” (John 14:8-9, emphasis added). The two, actually the three, are inseparable. Were someone to ask me, “Show me your mind.” If they were someone with whom I was well acquainted, I might reply, “As long as you have been around me, you know how I think, you know how I act – if you have seen me, you have seen my mind!” As our leading verse expresses, Jesus is the very image of God. As I consider this, I recall that many in the Old Testament saw God, beginning with Adam and Eve. In Genesis 3, after the first couple disobeyed God, “And they heard the voice of the LORD God walking in the garden in the cool of the day: and Adam and his wife hid themselves from the presence of the LORD God amongst the trees of the garden” (Genesis 3:8, emphasis added). Would a “spirit” make any kind of sound while walking or would a spirit have the need to “walk”? Possibly, but probably not. I conjecture that God in this case appeared as the pre-incarnate Christ. There are some who suggest that the first humans were clothed in “light” and that when they ate of the fruit, the light was extinguished and they saw their naked bodies for the first time. The Bible often describes God as surrounded by dazzling light. It makes sense, therefore, that the couple felt shame because they were no longer clothed as their maker. I further conjecture that in order for God (Christ) to clothe the couple, He personally, in physical form, had to slay the animals that would be used to cover His fallen creatures. (As an aside: He didn’t do the same for Satan when he rebelled.) This pattern of “sacrifice” would be followed by Adam and his descendants from then on. (See the sacrifices of Cain and Abel in Genesis 4:3-5.) Later, Abraham had personal encounters with the pre-incarnate Christ: Genesis 12:7; Melchizedek in Genesis 14:17-20; the “angel” in Genesis 18, etc. There are many more examples of this in the Old Testament that would take an entire study, but as I continued to ponder this, I was reminded of Isaiah’s encounter with God. “In the year that king Uzziah died I saw also the Lord sitting upon a throne, high and lifted up, and his train filled the temple” (Isaiah 6:1, emphasis added). Did Isaiah see a spirit? Does a spirit sit on a throne? Does a spirit wear a kingly robe with a long train? These are physical attributes. I think Isaiah saw the physical manifestation of God, i.e., Christ. Ezekiel saw a similar manifestation of God. Ezekiel describes a most unusual craft that transports the spirit (Ezekiel 1:20-21) of God. But upon closer inspection, this “spirit” has physical attributes. Ezekiel reports, “And above the firmament that was over their heads was the likeness of a throne, as the appearance of a sapphire stone: and upon the likeness of the throne was the likeness as the appearance of a man above upon it. And I saw as the colour of amber, as the appearance of fire round about within it, from the appearance of his loins even upward, and from the appearance of his loins even downward, I saw as it were the appearance of fire, and it had brightness round about. As the appearance of the bow that is in the cloud in the day of rain, so was the appearance of the brightness round about. This was the appearance of the likeness of the glory of the LORD. And when I saw it, I fell upon my face, and I heard a voice of one that spake” (Ezekiel 1:26-28, emphasis added). (Just as an aside (again), it is interesting that whenever the Lord is seen displaying His glory, men fall down on their faces to worship – no raising hands and swaying bodies – for whatever that is worth.) The Apostle John describes a similar scene at his first view of the resurrected Christ (Revelation 1), and his first view of heaven (Revelation 4). In each instance, God is given physical attributes. But how can a spirit have physical attributes? It cannot. 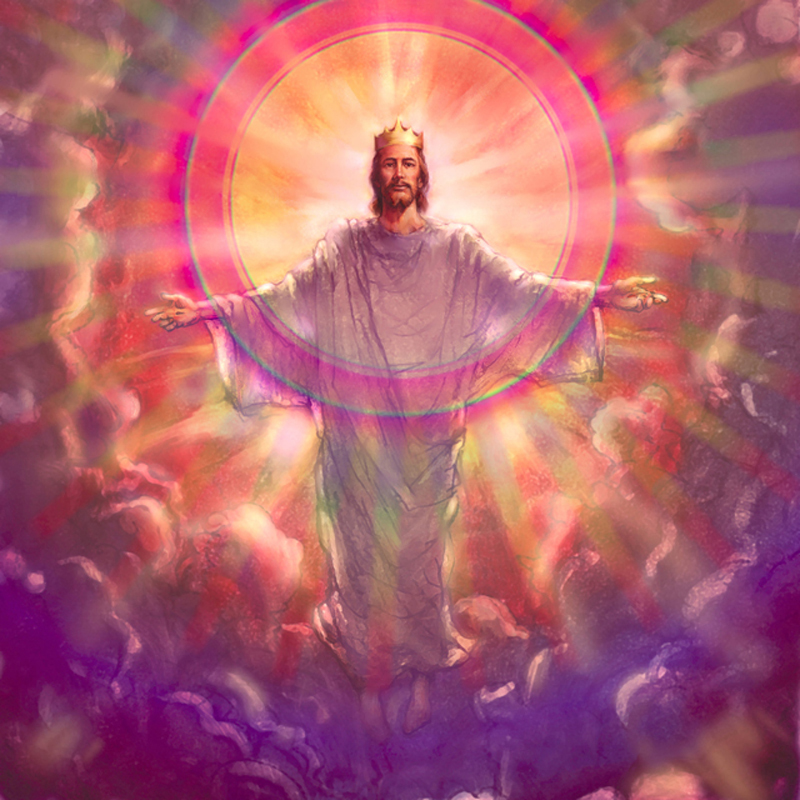 Jesus is the embodiment of the Godhead. The three, Father, Son and Holy Spirit are manifested in the One, the Lord Jesus Christ in whose image we are made. Jesus is the invisible, visible God.